Salt made using water from the ocean around Sakitojima, which is an island in Nagasaki Prefecture that faces the portion of sea between Kyushu and the Goto Islands. Can be used in cooking, or to make various sorts of pickles. 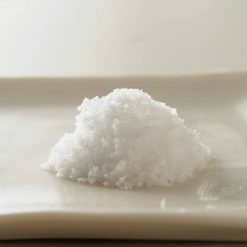 Our salt is cooked carefully in a special flat pot and made into flake-like crystals, making it easy to dissolve and well-suited for cooking. It also has a mild quality due to the miniscule amounts of various minerals it contains. Seasonings can be a crucial part of a meal, turning plain food into a delicious experience. After all, sometimes we only think we don’t like certain foods because we haven’t tried them with the right seasoning! Sugarlady’s salt and other seasoning products are safe and free of chemical seasonings and additives, letting the true, natural flavors of the ingredients themselves shine – and allowing you to enjoy your meal without worry. 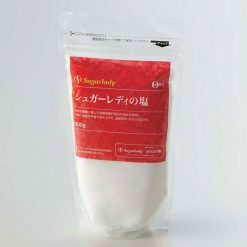 Our salt can be used approximately as follows (per 1kg of other ingredients): ① Instant pickles: 20g. ② 1 night pickles: 30g. ③ 2-3 day quick pickles: 40g. ④ Pickles that will keep 1 month: 60g. ⑤ Chinese onion pickles: 100g. ⑥ Umeboshi (pickled plums): 200-250g.Once you have made your own umeboshi, you can make a hinomaru bento box (white rice in a rectangular box with an umeboshi on top; meant to look like the Japanese flag) or roll them into the centers of onigiri rice balls!Aside from making pickles, our salt can of course also be used for ordinary seasoning (stews, noodles, chilis, etc), and is an essential component of any spice drawer. This product contains ocean water.. The recommended shelf life for this product is . Origin of ingredients: ocean water (Nagasaki Prefecture). Prepared and packaged in Japan.